I made a mixed media journal for birthday photos of Addie Blue's paint party for her 8th birthday. 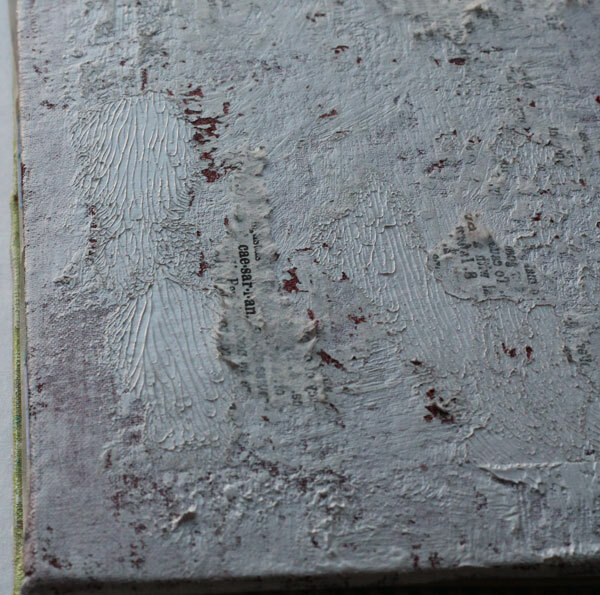 I took some individual step photos along the way to share how I created this textured cover out of just gesso, water soluble artist crayons, a bit of matte gel, a paintbrush, and water. The completed journal can be seen here. watercolour pencils matte gel hard bristled paint brush (I used sizes 4-8). 1. 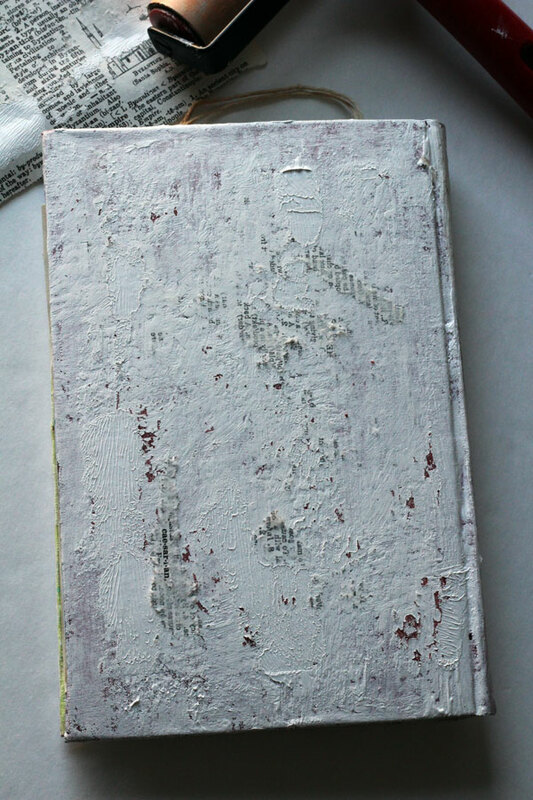 Coat the journal cover with gesso. 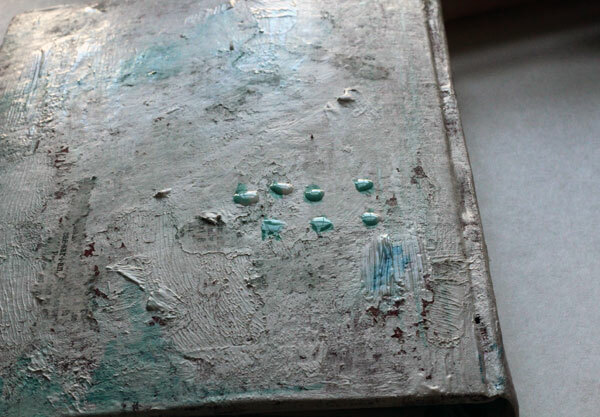 Because I wanted a very textured, random appearance to my finished cover, I applied an uneven coat of gesso. I left some small areas highly textured and dimensional where I did not smooth out the gesso, and other areas I painted until smooth. Experiment with adding more, or less, water on your brush to provide greater variation in the coverage. Let this layer dry for a few minutes, until tacky. It does not have to be completely dry. 2. 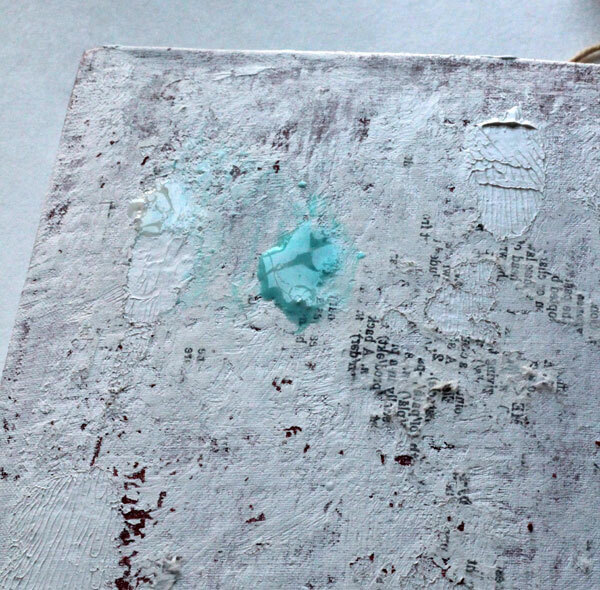 Add a thick layer of gesso where you would like to apply the book page. I covered most of the centre portion of the cover for my journal. 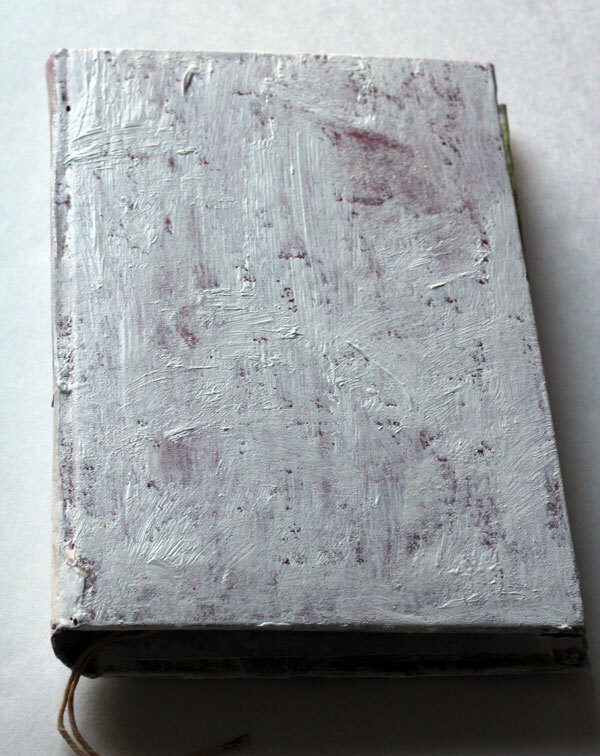 Immediately press the book page into the wet gesso. I have found thinner, older book pages to work better than new ones. Avoid thick pages, anything with a glossy finish, and thick scrapbooking paper. Gently press the page into the gesso. You may need to go back and work it in several times over a few minutes. 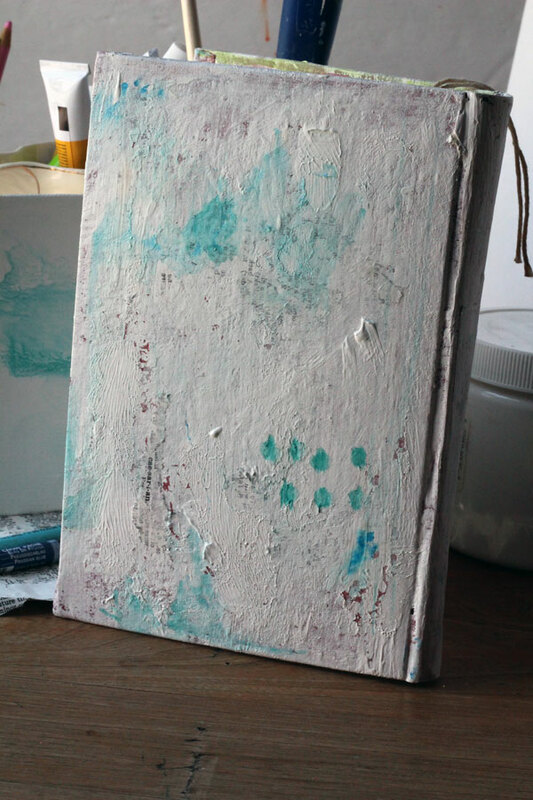 I used my fingers to gently press straight down on the page, patting it firmly into the wet gesso. Once it had sat for a few mintues the page started to bubble up, so I used a brayer and firmly burnished the page back down. When the book page feels dampened through and looks like it has stuck down into the gesso, carefully and slowly peel it back up. 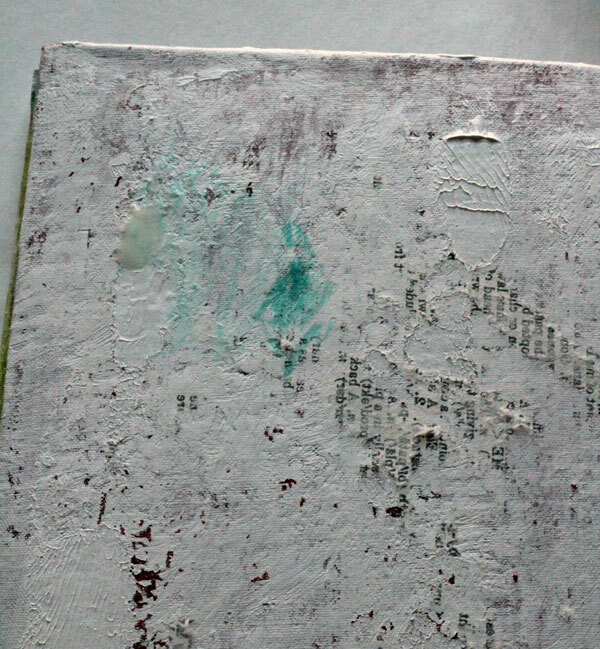 Some of the paper will stick to the wet gesso on the journal cover, and peel and separate away, remaining on the journal cover as you lift away the book page. The result will be a random application of text to the journal cover. Let this layer dry for a while. 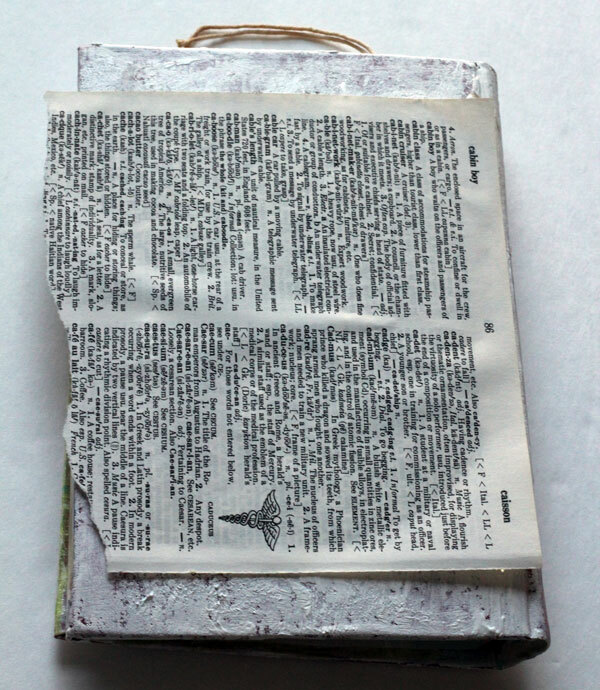 Here is a close-up detail showing some of the adhered, torn dictionary page. 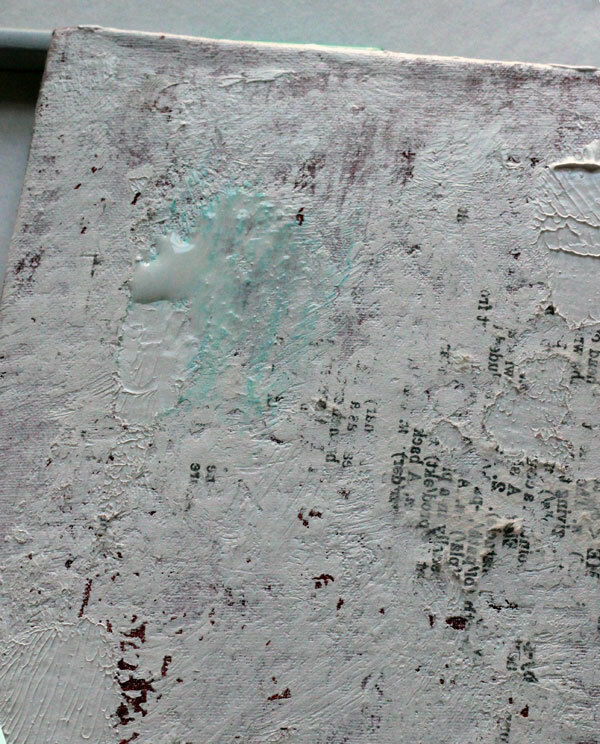 You can see how textured and thick the gesso is in some areas, and thinner and more transparent in others. 3. 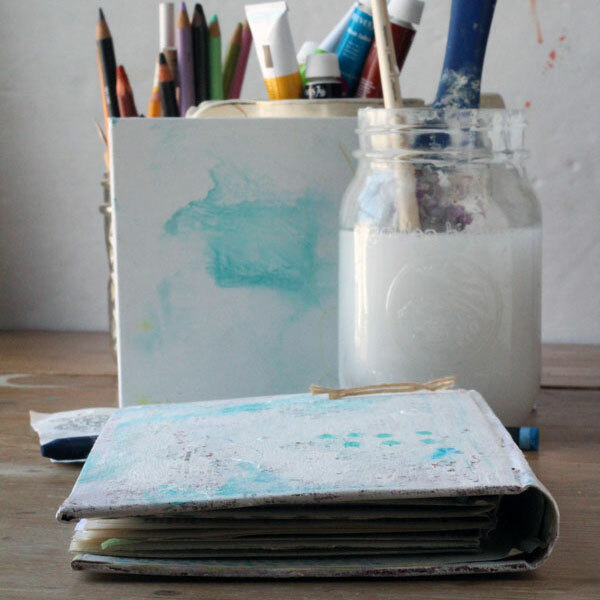 Once the gesso and book page layer has dried almost completely, apply watercolour pencils to random areas of the journal cover. I wanted my cover to be light coloured with only touches of blue, so I chose to use a limited amount of watercolour pencil. If you would like your cover to be more coloured, add more coverage with the watercolour pencil. I also wanted my cover to be monochromatic, so I used a single aqua watercolour pencil. To create depth, texture, and layering, I used light and sparse or heavy and complete coverage with the watercolour pencil. Colour directly onto the journal cover. I wanted freeform touches of colour, so I really just scribbled on the page! I kept the areas of colour isolated and independent from each other. 4. Blend the watercolour pencil immediately. I just dotted some water on top of the areas I coloured. I did not try to cover the watercolour pencil pigment completely with water, nor did I blend the pigment into the journal cover. I just let the water sit on top. Because my gesso layer was not fully dry, some of the gesso and wet watercolour pigment blended together randomly, creating a ghostly appearance. Let this layer dry. 5. Go back and add in additional areas of colour. I started with a few light areas in the step above, and once dry I added two additional darker spots of blue. Again, I just dotted the water on top of the watercolour pencil pigment, rather than painting and blending it in with brush strokes. Because the gesso was dry, the watercolour appears much clearer and bolder. 6. Add additional gesso layers or watercolour layers as desired. Experiment with adding the next layer before the previous one is dry. If you have added too much colour, just paint over it with more gesso! This layering of watercolour pigment and gesso, and applying varying amounts of pigment or water to create transparency will create a visually textured appearance in the final product. 7. Once all of the layers were completely dry, I added in one final layer of watercolour pencil. I drew in some random scribbly dots, and again, dotted water over top to soften and solubilize the watercolour pigment. Let stand to dry. 8. 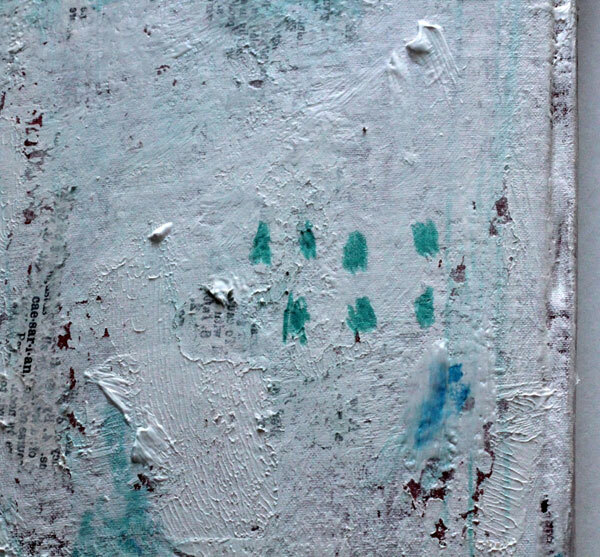 I applied a random, incomplete layer of matte gel over a portion of the journal cover for additional texture. Although this acrylic medium has a matte finish, matte gel holds brush strokes and texture well as it dries, and the finish of the dried product catches the light differently than the matte appearance of dried gesso. 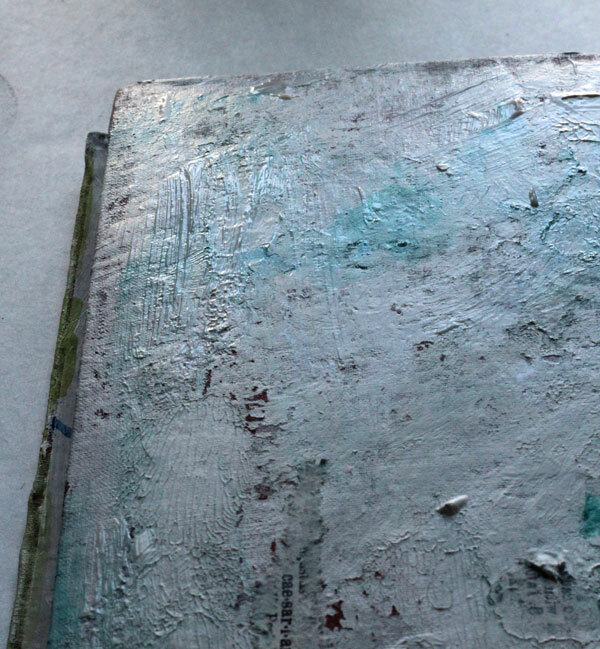 This extra layer of medium provides interesting visual and physical texture to the journal page. 9. Completed, dry journal cover. To see the complete journal, click here. Supplies: journal cover (I used an old, fabric covered book); gesso (Faber-Castell); old book or dictionary page; matte gel (Faber-Castell); watercolour pencils (Faber-Castell); hard bristled paint brush (I used sizes 4-8).